France A, justified their top seeded position, to secure gold in the Junior Boy’s Teams Event at the 2015 French Junior and Cadet Open in Metz. Russia clinched the title in the Junior Girls Teams Event. Boy’s A team beat their compatriots from B team. Alexandre CASSIN gave the champions the perfect start by beating Irvin BETRAND, before Can AKKUZU accounted for Joe SEYFRIED and Nolan GIVONE brought matters to a conclusion by defeating Remi MENAUD in the final. In semis France A beat Japan whilst B team succeeded against Czech Republic. The team of Russia with Maria TAYLAKOVA, Daria CHERNOVA, Maria MALANINA and Valeria SHCHERBATYKH despite their defeat in the Groups stage against Germany managed to recover and to clinch the title in Girls event. At the final hurdle they overcame Romania with Diana LUPU, Adina DIACONU and Andreea DRAGOMAN. In semis Russia beat France B, whilst Romania beat combined team of England, Japan and Romania. Moldova and France A secured the respective Cadet Boys’ Team and Cadet Girls’ Team titles. The success recorded by Moldova was a major upset.They started proceedings as complete outsiders, they were the no.12 seeds; the top place gained by France A was less of a surprise; they were the no.2 seeds. 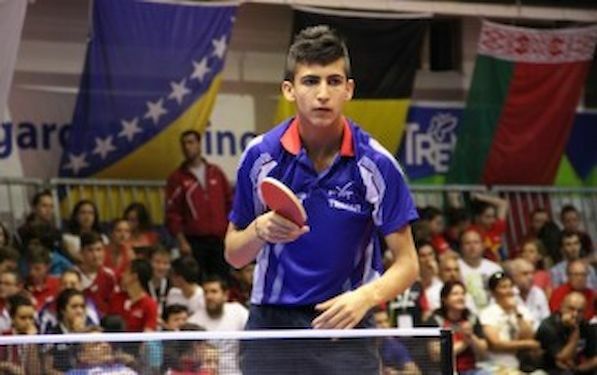 In the final Vladislav URSU and Cristian CHIRITA beat Japan’s Yu KAYAMA and Takeru KASHIWA. Earlier Japan beat France B, whilst Moldova prevailed against Germany A. In Girls Event Lucie GAUTHIER proved the mainstay of French success in the Cadet Team final against top seeds Sweden. She beat both Hanna KJELLSON and Christina KÄLLBERG; whilst teaming with Leili MOSTAFAVI to secure the doubles. The one win for Sweden came in the second match of the fixture when Christina KÄLLBERG overcame Leili MOSTAFAVI. France A and Denmark – India reached bronze.